Originally published in 2007, this is an updated and revised edition that accompanies the current exhibition at the V&A, Balenciaga: Shaping Fashion. Where the exhibition looks at Balenciaga’s skills, craftsmanship, approach to fashion and legacy through the garments on display, in the book you understand more of the background into Cristóbal’s Balenciaga’s history, upbringing, introduction to dressmaking and tailoring through to his setting up a fashion house in Paris and joining the elite of Parisian Couture. The book explores in some detail how his business operated, why his work was so popular with his clients and how he differed to the other Masters of Couture that were his contemporaries. It is worth noting that the figure of Cecil Beaton, celebrated war, fashion and Royal Family photographer hovers throughout the book. 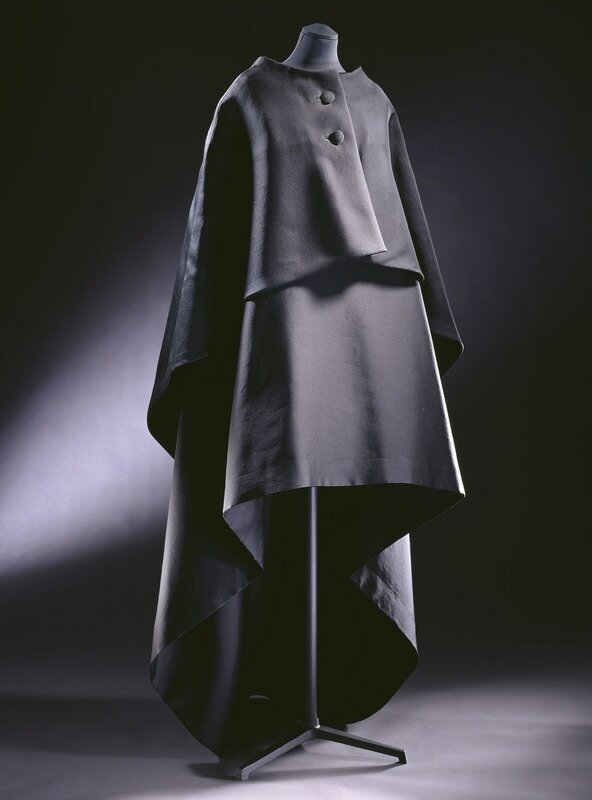 It is mainly due to him that the V&A acquired many of the Balenciaga pieces that make up their collection in the 1970s. 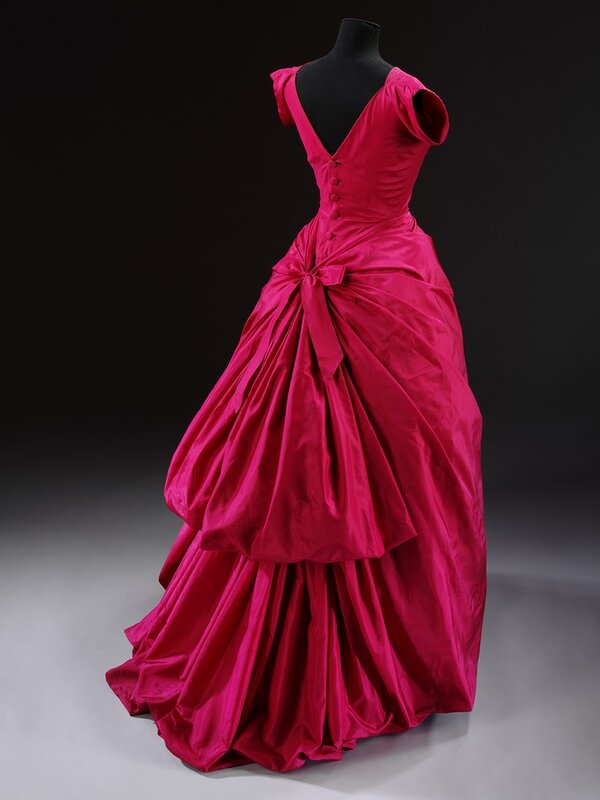 Each chapter is introduced with a quote about Balenciaga from Beaton and Beaton’s love of the clothes and the encouragement for museums to start collecting them as pieces of art led to a close friendship with the designer that provided some insight into his practice that was denied to the press at large. If you are interested in learning how Balenciaga operated, there is a great section on how his business was run. 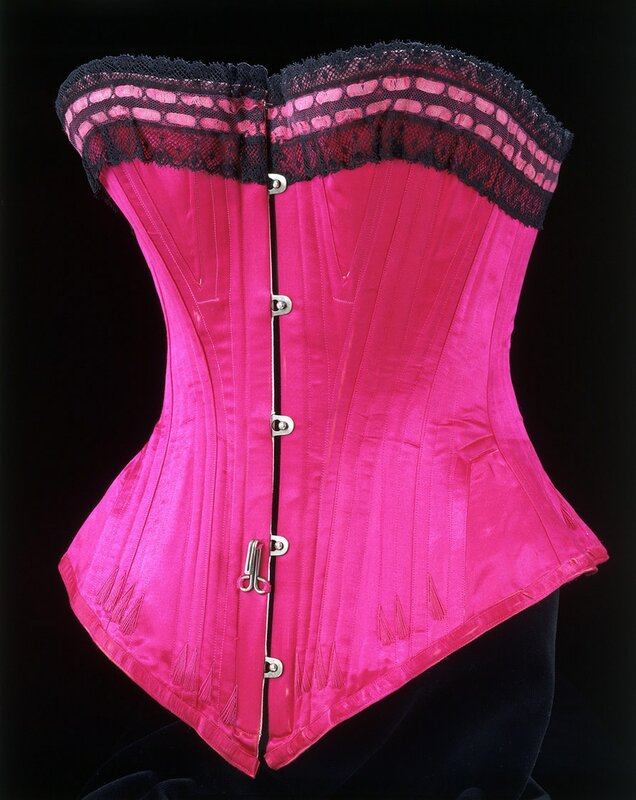 Having a legion of private devoted clients, he ran the salon on Avenue George V in Paris but also three fashion houses in Spain (the exhibition shows some pieces from one of these Eisa) which provided cheaper garments that followed the Paris Models (the name given to a design). Being aware of how to run a business based on customers being able to access his designs in a variety of ways, he sold models to high-end department stores (such as Harrods) that would have Made to Measure departments in store and who would buy a design and make it for their clients around 40 times. Commercial buyers would also buy models with 8-10 derivatives which would be reproduced around 400 times. Both these methods of buying Balenciaga designs had exclusivity despite not being made by the fashion house directly. Balenciaga’s approach to design suited this business approach very well. Rather than being geared towards producing vastly different looks each season, the styles tended to evolve over the years so that from season to season, changes were made but not always discernible. Models bought commercially would have a greater shelf life and private clients could get more wear out of their garments without going out of fashion by the time the next collection came out. In fact, his gradual development and experimentation stretched throughout his career and the clothes of the 1950s and ‘60s demonstrated how far the designer had come. By stripping back extraneous details, relying on clever pattern cutting and reducing the number of seams, he moved into the realm of Avant Garde with some of the more outlandish clothes that can be seen both in the book and exhibition. His vast knowledge of fabrics, shape and manipulation created some amazing forms and the book’s presentation cleverly introduces this aspect of his design throughout and brings it full circle. Touching on his legacy, it is this aspect which is most striking about the work he inspired in his employees who later set up as designers themselves (Hubert de Givency, Paco Rabanne, Oscar de la Renta) or contemporary designers who are inspired by the shapes and pushing of boundaries that he evolved towards. You can see many of these garments at the exhibition but the book gives a little more background information about them and what they have taken from Balenciaga to develop their own style. Published to accompany the V&A’s latest exhibition about the history of underwear, this catalogue perfectly captures the essence of the show. The book is split into four chapters – Hygiene and Comfort, Shapeshifters, Lingerie & Hosiery and Revelation & Transformation. Much of the book is given over to the photographs and here you get to see a lot of the pieces on display in much finer detail (rather than behind glass as at the exhibition) and sometimes from a different viewpoint. From the beginnings of underwear as fulfilling a hygienic purpose, each chapter details how its key functions have changed over time. You come full circle by the final chapter where you still have underwear worn as it was originally conceived, for hygiene, support and structure but as “the substructure of the fashion of the day”, these fundamental purposes have, over time, been reinterpreted and redeveloped through fashion and changes in society’s view to give it an aesthetic and genre of its own. You do not see some of the more exciting pieces in the book and so would have to go to the exhibition if you want to see Dita Von Teese’s 18-inch waisted Mr Pearl corset or the fantastic Dress and Knickers designed by John Galliano for Givenchy, which is so much more exquisite in the flesh but this catalogue will give you a concise overview of the progression of underwear from the 1750s and bring you right up to the present day. 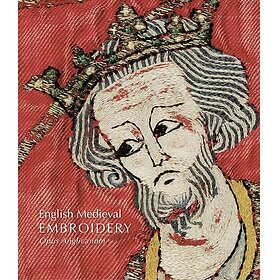 The official catalogue for the Opus Anglicanum exhibition currently on at the V&A covers ‘one of the crowning glories of English Medieval Art’. The ‘English Work’ was a period of time when religious and secular embroidery was hugely sought after for it’s craftsmanship and beauty. The catalogue is separated into a series of essays at the start followed by more detailed information on eighty three exhibition pieces. For some of the larger pieces such as the sumptuous copes, diagrams of their design and motifs are included and they are given a double-page spread. To be able to see the detail (particularly of some of the embroidery techniques) is a gift. The essays consider the historical context of this period of embroidery from it’s peak output and demand to the present day. These essays are written by leading experts in their field and as well as putting the works on display under the spotlight, it raises academic questions about our understanding of the subject. A major topic is the beginnings of the intellectual exploration of Opus Anglicanum’s importance in the Eighteenth and Nineteenth Centuries brought about by the acquisition of surviving pieces heralding in-depth study into the period. With the publication of this catalogue we reach a new starting point for developing our understanding of this fascinating period. The essays highlight that thinking in terms of surviving materials and how to assess their quality, value and importance are still to be properly thought out. Rather than a final word on the subject, it is clear that this is just the beginning.